Gambling Risk Informed Nova Scotia (GRINS) exists to raise awareness of the community harms of gambling. While it is not uncommon to know of someone who has been negatively affected by their gambling, and to see the damage done to the individual and their family, what are less understood are the various ways that higher-risk gambling, such as with Video Lottery Terminals, harm entire communities. From what research shows, the harm extends beyond the individual and the family to entire community in ways that are significant. In Kings County, for example, within an area between Windsor and Berwick, $4 million dollars a year of the money that is spent on VLTs leaves the county in payment to the Atlantic Lottery Corporation. The money lost is not kept within the community to support local businesses, local not-for-profits or charities, and communities are weaker because of this. We are not about ending gambling. We ARE about encouraging conversations about the kinds of higher-risk gambling, such as VLTs, that harm us all, whether we ourselves gamble or not. 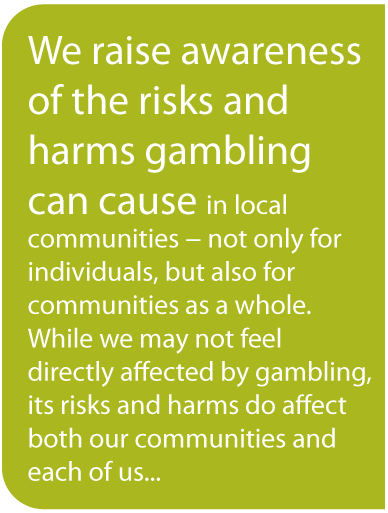 By sharing what research tells us about this kind of gambling and the harms that it creates, we can decide together, as aware members of our communities, if there is action we want to take, and if so, what that action will be. Responding to resource requests from organizations. We have developed a broad range of infographics, poster boards and facts sheets about gambling and its harms that help people to have informed discussions. Hosting events with groups of individuals representing municipalities, business, community-groups and health organizations, sharing what we know about the issue and the impact that higher-risk gambling has on the work that we each do. We then look at ways we can further the discussion and find some solutions together. Developing opportunities through social media to open the conversation about gambling harms. Our recent introduction of Gertie the Gamboling Goat on various social media platforms provides a way to open the discussion of gambling across our province. Providing resources to groups that want to better understand the harms of gambling to the community. Through the interactive workshop called “Our Town” we are able to provide tools to support the discussion on gambling within communities across our province. In everything we do as a community-based organization, we aim to encourage respectful discussion of an issue that has broad impact on us as Nova Scotians.